A lot of the old bristlecone pines are twisted and gnarled like this one. There was only one problem… the tree’s exact location is kept a secret to protect it from vandals and those who might love it to death. And that’s definitely for the best. In 2008, an arsonist burned down the Ancient Bristlecone Forest Visitor Center and several of the ancient bristlecones. Bristlecone pines can grow in the harsh alpine conditions of the White Mountains. 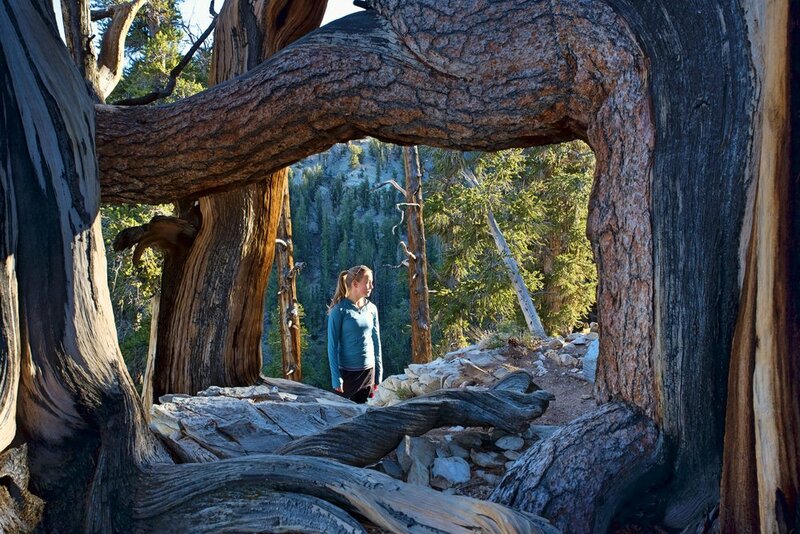 Methuselah may be the oldest, but all the trees in the grove are unfathomably old. Even science itself has harmed the ancient forest. In 1964, Donald Rusk Currey got his tree corer stuck in a tree he was measuring, and a helpful park ranger assisted him in cutting the tree down to free the tool and learn the trees age. It wasn’t until counting the tree’s rings that he realized they had just felled what was believed to be the oldest tree in the world. The Prometheus Tree, as it is now called, was over 5,000 years old, hundreds of years older than Methuselah. Even after extensive research on the dustiest corners of the Internet, we were unable to find any clear clues about the location of Methuselah or even the tree’s characteristics. Congrats to the Forest Service for keeping the only secret on the Internet! We decided we would just have to be satisfied with hiking in the Methuselah Grove, which contains the Methuselah tree and hundreds of other ancient trees. Could this tree growing on the rocks be Methuselah? Perhaps one of these is the world’s second oldest tree? Maybe this grizzled specimen is Methuselah? Approaching the Ancient Bristlecone Pine Forest, we rose in elevation from the desert of Nevada and into the White Mountains of California. 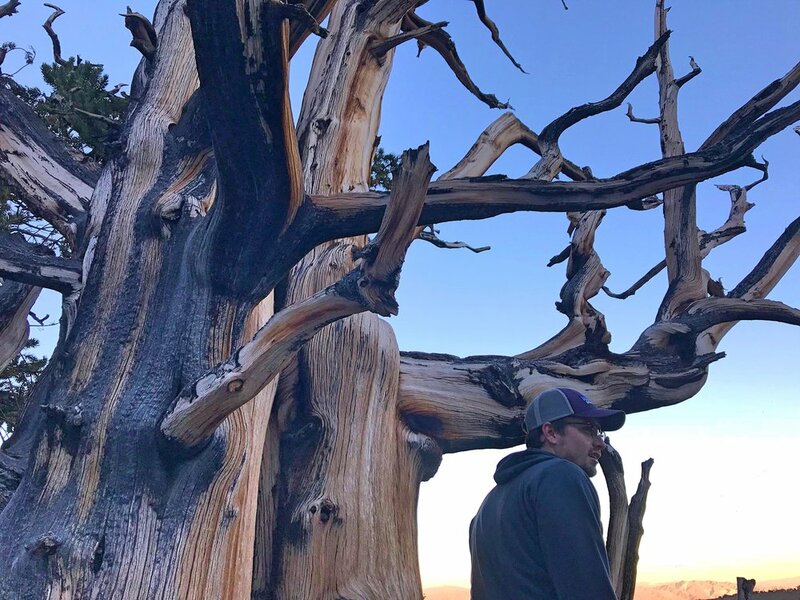 We went from seeing cactuses, to pinyon pines and juniper, to eventually reaching the gnarled bristlecone pines, which only grow between 9,800 and 11,000 feet in xeric alpine ecosystems. When we arrived at the Methuselah Grove (elevation 10,000 feet), we stopped at the visitor center to learn about the ancient species, before heading out on the four-mile hiking trail. The trail runs along the steep side of the mountain on which the stand of ancients grows. It eventually crests a rocky ridge before looping back to the visitor center. We left 80-degree weather in the Nevada desert earlier in the day, but at this elevation, it was only about 50 degrees. The thin air at 10,000 feet made hiking more of a challenge than usual. Kaylee enjoying the fading evening light along the Methuselah Trail. 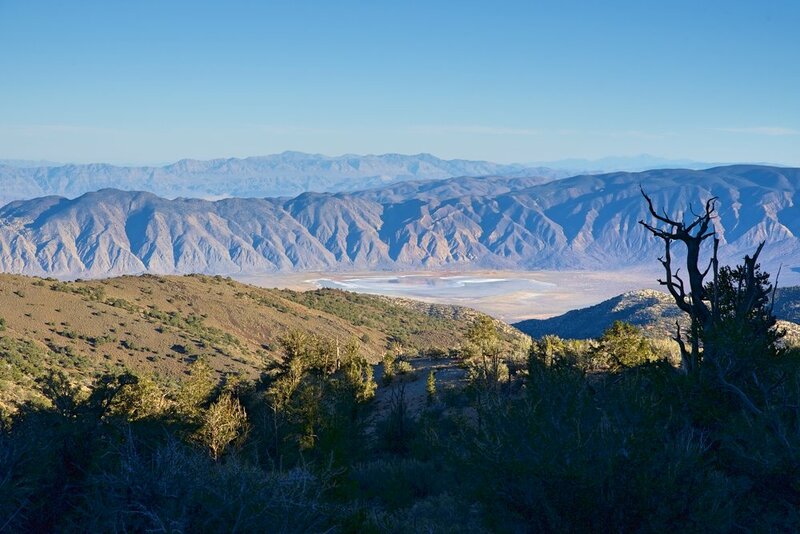 Besides the venerable trees, the Methuselah Trail also gives you great views of the mountains. One of the most surprising features of these arboreal ancients is their diminutive stature. Giants like Sequoias and Redwoods are likely the first trees that come to mind when most people think of very old trees. The bristlecones are gnarled little gnomes of trees, and their height actually has little correlation to age. Most don’t grow any taller than 30-feet. While we were hiking, we speculated a lot about which tree Methuselah might be, but there were no obvious contenders. Just hundreds of beautiful trees. Many of the trees have dead branches and portions of trunk where the bark has sheered off, leaving behind colorfully twisted wood. Ian standing by a tree that has lost all of its bark. The shapes these trees have assumed over the years are quite absurd in some cases. Now that we’ve seen the second oldest trees on Earth, we’ll have to add “Old Tijkko,” a 9,560-year-old spruce in Norway to our bucket list. Free camping nearby: We camped just a short ways down a 4x4 road in the Inyo National Forest beyond the boundary of the Ancient Bristlecone Pine Forest. (Four-wheel drive was not required to access the site). If you plan to camp in the area, make sure you are outside the Ancient Bristlecone Pine Forest where dispersed camping is not allowed. We caught the sunset at this overlook while coming down from the Ancient Bristlecone Pine Forest. Dispersed camping in the Inyo National Forest.